We had been looking for some good travel food recipes, something to have at the ready for our weekly drive to Emma’s orchestra rehearsal five towns over, when this one from one of my favorite food bloggers turned up in a search. We make it in quadruple batches now on the weekends, so far, only using “common” dried fruits like raisins and apricots with almonds as our nut of choice. That combination has never disappointed anyone here, but I’m sure other more creative dried fruit and nut combinations would be equally good or better. Experiment. And let us all know what you cook up. Preheat the oven to 350 degrees. Line an 8 x 8″ pan with parchment paper one way, allowing it to lap over the edges of the pan so it will be easy to take the bars out. Butter the parchment paper and the exposed part of the pan. Stir together the dry ingredients, including the fruit and nuts. In a separate bowl, combine the vanilla, melted butter, and honey, then pour the wet ingredients into the dry ingredients and mix thoroughly until the mixture is evenly crumbly. Press it into your prepared pan. Press firmly. We want these to come out like granola bars, right? Bake the bars for 30 minutes or so, until they’re brown on the edges. Then cool the bars completely in their pan. You could also lift the bars out with the parchment paper and cool them on a rack. 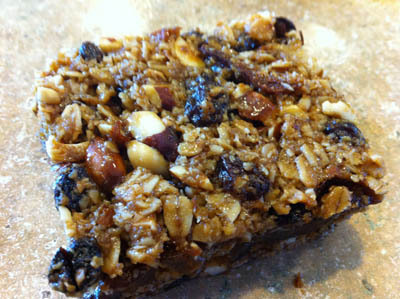 When they’re cool, use a serrated knife to cut the granola into bars. The original recipe suggests that you put the whole pan in the fridge to chill for half an hour or so if you have problems with the bars crumbling. I didn’t have any issues with crumbling, which is part of the reason this has been the perfect bar for us. We planned to freeze these bars and use them for travel food, so I don’t know how long they’ll keep at room temperature. It does seem that they’d be best kept in the fridge or freezer, individually wrapped for grab-and-go-convenience.